Settled by Europeans in the early 1700s, the township was named for James Alexander who purchased 10,000 acres in this locale in 1744. Alexandria includes the historic villages of Everittstown, Mt. Pleasant, Little York and part of Pittstown. Measuring 28.1 square miles, the township presently has about 5,000 residents. Farming still plays an important role in the life of residents. Crop, dairy and horse farms continue to dot the countryside. Bethlehem, especially the industrial community of South Bethlehem, grew in the late 1800s as the iron and steel industry grew along with machinery, coke, cement, and textiles for export. The Bethlehem Iron Company produced steel rails beginning in 1873, and established a forge in 1885. The plant was the first in America to produce steel armor plate and cannons, and military contracts contributed substantially to the Company’s growth and prosperity. Through the late 1800s and into the early 1900s, waves of immigrants from different parts of Europe settled in the community. Bloomsbury is located on the south side of the Musconetcong River in the northwest corner of Hunterdon County. The name is derived from the Bloom family, who were influential in the early history of the town. It was once part of Bethlehem Township, but was incorporated as a separate borough in 1905. The Borough was originally known as "Johnson's Iron Works", named after the charcoal work of Robert Johnson on the north bank of the river. In colonial days, ore from the Musconetcong Mountain was carried down to the river and made into "blooms", masses of wrought iron from the forge. This is another theory of how the Borough received its name. The town name was shortened from the original "California" in honor of a resident returned from the Gold Rush. Many homes in this small borough that straddles the South Branch of the Raritan are featured on the state's historic register. Fishermen flock to Califon for the trout, but there's no fishing from one of the region's few remaining 19th century wrought-iron truss bridges in the heart of the village. Many surviving World War II veterans and citizens included in their Memorial Day observances a memory of Victory in Europe or V-E Day, which occurred 57 years ago on May 8, 1945. Clinton, as most other communities across the nation, greeted Victory in Europe with both gratitude and sorrow; but also with an attitude of looking forward to the future. The Herald-News, Passaic, NJ printed articles about Clinton’s citizens involved in the fighting in Europe and Asia and community efforts to assist their fighting brethren on a daily basis. May 7th, the day before V-E Day, was no exception. We read about gunner S/Sgt. Charles Librizzi harrowing experience aboard a Flying Fortress B-17 bomber. Leipzig, Germany was the target of their bombing raid, but Leipzig returned the favor with antiaircraft shells. Hunterdon County, named after Governor Robert Hunter, was formed March 11, 1713, consisting of nearly all of the present Mercer, Hunterdon, Morris, Sussex, and Warren counties. 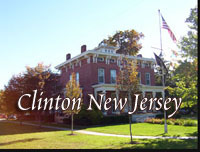 The new county was divided into several huge townships included Lebanon, in which what is now the town of Clinton began. Soon the West Jersey Society of London controlled the area, and began to sell off tracts of from 5000 to 100,000 acres1. In November of 1751, the Society sold the land which was to later become Clinton to Mahlon Kirkbride. Records show that Kirkbride, who lived in Bucks County, Pennsylvania, bought 4180 acres; this tract contained a large part of the present site of Clinton, mostly on the east side of the South Branch. Jonathan Robeson, another rich land investor, formerly of Piscataway Township, Middlesex County 2 bought over 800 acres from the West Jersey Society in 1752 on the west side of the river. Established in 1838, Delaware Township is bounded on the southwest by the Delaware River, across from Bucks County. The rural community, still retaining much of its beautiful farmland, has two principal creeks: The Lockatong, crossed by an excellent metal truss bridge and the Wickecheoke by the State's only remaining 19th century covered bridge. A post office, housed in what used to be a butcher shop, and the township government, in a 225-year old municipal building, are in Sergeantsville, in the heart of the township, also home to the Sergeantsville Inn and many charming old houses. On the 4th of July, the township celebrates the Great Crate Race, and its annual Thanksgiving in the Country tour is widely known. There are several other hamlets in the township, including Rosemont, Sandy Ridge, Raven Rock, and Locktown, as well as Bull's Island State Park. In 1708 Amwell Township was established by Royal patent of Queen Anne and contained 130,000 acres, almost half of present day Hunterdon County. Set in a valley at the base of the Sourland Mountains, East Amwell remains primarily agricultural, and a number of its working farms have been spared from development by state and local preservation efforts. Ringoes, the township's biggest village, is the home depot of the Black River and Western Railroad, which runs a steam engine excursion train between Lambertville and Flemington. Other hamlets in the township include Weert's Corner, Larison's Corner, and a portion of Reaville. Since 1785, Flemington has been Hunterdon's county seat, home of the courthouse, the County Clerk, and some of the other county offices, although the County Freeholders now meet a few miles west in Raritan Township. 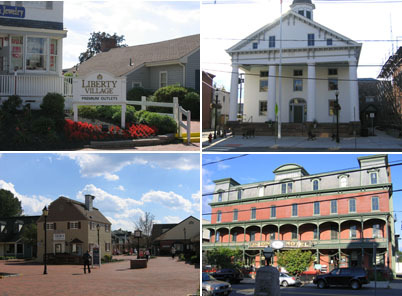 Much of its small-town charm is reminiscent of an earlier era; two-thirds of the borough's structures are listed on the state and national historic registers. In 1935, the world shone a spotlight on sleepy Flemington when the trial of Bruno Hauptmann, who was charged with the kidnapping and murder of Charles Lindbergh's infant son, was held in the old Main Street courthouse. Since that event, Flemington has sprouted over 100 outlet and specialty stores, and grown popular as a shopping destination. Right smack in the heart of Hunterdon, lies Franklin Township, established in 1845 as an agricultural community, but settled in the early decades of the 18th century by Quakers moving north from the Trenton area. Like several Hunterdon municipalities, it has no towns, only hamlets, including Cherryville and Oak Grove, and two villages, Pittstown and Quakertown, with post offices. Quakertown has one of the state's few remaining Friends meeting houses built of stone. Franklin's agricultural heritage is encouraged by on-going farmland preservation, which now protects 1,156 acres and by protective right-to-farm ordinances. Seventy percent of Franklin is under farmland assessment and Rutgers' Research Farm is there, on 377 acres donated by residents. Frenchtown, along the Delaware River, is home to antique stores, art galleries, specialty shops and fine restaurants. The town was named for a Swiss founder who local residents thought was French. Once a manufacturing and trading center, the borough, with its tree-lined streets and 19th-century houses has undergone a renaissance, thanks to downtown renovation and growing tourism trade. The original Presbyterian church, built in 1845, now houses the town library and municipal offices. Glen Gardener was never a sleepy farming community, even before the coming of the railroad in the mid-19th century-it was originally known as Sodom, from the wild behavior of some of its residents, and later as Clarksville. Route 31 and Spruce Run Creek, source of sport fishing for many years, divides the town. Sweeping upward from School Street is the one of the County's bridges, Pony Pratt Bridge, listed on the National Register. Charming houses and balconies, built close to the street, help the town retain a 19th-century look. In the 1980's, townhouses and single-family homes built on the outskirts of town doubled the borough's population. Hampton rests on what is commonly referred to as the "highlands" of Hunterdon County. A former railroad town, the borough was originally named Junction because it grew up around the junction where the Delaware Lackawanna and Western met the Central Railroad of New Jersey. The area had been a gathering place as far back as when Native Americans camped the banks of the Musconetcong, which forms the northern border of the borough. Today, the borough is a mix of highway development and quiet residential streets. The original area, known as West New Jersey, was inhabited by a division of the Lenape Indians and settled around 1700. In 1742, William Allen leased a 3,000-acre site extending from present day Califon, New Jersey, to Pattenburg from the West Jersey Society, on which he and his partner, Joseph Turner, established the first ironworks in Philadelphia's colonial times. In 1752, Allen and Turner purchased 10,849 acres in Bethlehem and Lebanon Townships which included our present-day High Bridge. In early 1758, Robert Taylor came to the area from Ireland at the age of 17. Well educated, he first taught school in Kingwood Township, but became bookkeeper for Allen and Turner toward the close of 1758 having taken residence with then ironworks Superintendent Colonel Hackett in a house now a portion of the Taylor mansion (now Solitude House located at 7 River Road). When Colonel Hackett died in 1775, Robert Taylor was chosen as his successor. With the Musconetcong River to the north and the Delaware River to the West, Holland Township offers a richly varied topography of valleys, hills, streams and woodlands. Holland's economy was dominated by agriculture and the paper industry until the latter part of the 20th century. Oak Hill Golf Course and the Riegel Ridge offer recreational opportunities. 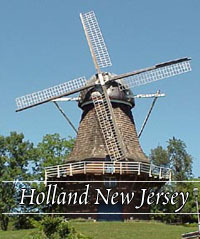 The Volendam Windmill, a full-size working replica of a Dutch windmill, and Edelweiss Farm, where one may view llamas, reindeer, emus, kangaroos, and other fascinating animals, are popular stops for tourists and locals. With fine old houses tucked among its hills and valleys, the township offers beautiful scenery, sizable lots and the lowest tax rate in the county. Kingwood Township remains three-quarters agricultural and has the lowest population density in the county - 106 people per square mile, according to the 2000 Census. Kingwood is bordered by the Delaware River and a high rocky ridge. Here, highway builders had to blast through rock to finish the "missing link" of Route 29, and finish the state highway from Trenton to Frenchtown. Baptistown, Barbertown and Byram are among the few hamlets in this largely rural municipality, which also includes a significant portion of the Delaware & Raritan Canal Park. The land now occupied by the City of Lambertville was originally purchased from the Delaware Indians as a portion of a 150,000 acre tract along the Delaware River north of Trenton. Agents for the council of West Jersey purchased the parcel in 1703 for seven hundred pounds, or about $2,800. The council subdivided and sold the land to farmers and developers over the years. The portion occupied by Lambertville was quickly sold as two lots. The boundary between the two properties was called the "Bull line" and can still be traced on a City property map. The Bull line runs eastward from the river and cuts diagonally between Delevan and Jefferson Streets. It continues across Main Street to the Old York Road, now State Route 179. In 1705, the first resident of Lambertville, John Holcombe, purchased 350 acres north of the first survey line, the Old Bull line. In 1724, he built the stone house on North Main Street that became known as Washington's Headquarters. Holcombe purchased more property to the north that is now known as the Holcombe-Jimison Farmstead. 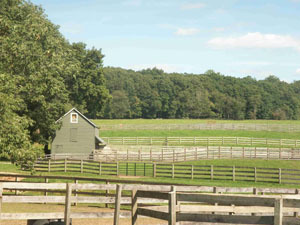 The Farmstead has been restored as a museum to illustrate farm life in Hunterdon County. Rugged, hilly Lebanon Township, bounded by the Musconetcong River, is the northernmost township in Hunterdon. It contains the villages of Woodglen, Changewater, and Bunnvale. The Township Museum, located in New Hampton, was built as a one-room schoolhouse in 1823. Voorhees State Park, with 500 wooded acres featuring picnic sites, hiking trails, camping facilities and the New Jersey Astronomical Association's observatory is also located here. Milford, on the banks of the Delaware, was named in the late 19th century for a mill and a ford across a stream. The borough is home to a thriving Farmer's Market on summer weekends, and a healthy commercial district includes a number of shops and restaurants, including the Ship Inn, New Jersey's first licensed brewpub in half a century, and The Baker, a nationally known distributor of fine breads. Raritan Township has the township form of government which is one of the oldest forms of government in New Jersey. The governing body is a township committee of five members who are elected for three-year staggered terms in partisan elections from the Township at large. There is an election of at least one member every year. The Township Committee annually chooses one of the Committee to serve as mayor for that year. The mayor presides at Township Committee meetings and votes as a member of the Committee, but has no other special powers under the township form of government law. All legislative and executive powers, including the power of appointments, are exercised by the committee as a whole. Readington is Hunterdon's largest municipality geographically and the second largest in terms of population. It may also have been the first to be settled, but English and Dutch colonists moving west from Somerset county. Readington retains much of its rural nature, with small towns like Whitehouse, Whitehouse Station, Three Bridges and Potterstown dotting the hills and valleys of the township. The hamlet of Centerville, with a couple of pre-Revolutionary War buildings, got its name because it was the center point on the Old York Road between New York and Philadelphia. Three major highways - routes 22 and 202, and Interstate 78 -- has made it a prime spot for industrial and corporate office complexes, including Merck & Co.'s world headquarters. Readington is home to the annual New Jersey Festival of Ballooning at Solberg-Hunterdon airport and Deer Path Park, where the Hunterdon County YMCA is located. Stockton, on the banks of the Delaware, is Hunterdon's smallest municipality and home of the state's oldest and smallest school. Prallsville Mills, a collection of 18th- and 19th- century buildings that once processed grain, lime and flax, now offers a series of concerts, exhibits and lectures. The historic Stockton Inn, long a favorite of artists and musicians, is the "old hotel with a wishing well" in the song by Rodgers and Hart. In the northeast corner of Hunterdon County, is Tewksbury Township, Hunterdon's wealthiest municipality with scenic views, luxurious homes and numerous villages and hamlet, including Fairmount, Pottersville, Cokesbury and Vernoy. The most visible of the villages is Oldwick, which changed its name four times since its founding in 1753. Here find the Oldwick General Store and the Tewksbury Inn, as well as the oldest Lutheran church in the state, which dates to 1749. At the bottom of Hell Mountain, nestles Mountainville, with many homes listed on the State and National Registers of Historic Places. Union Township in northwestern Hunterdon was named for the old Union Forge, an iron foundry that manufactured cannon balls for Washington's army during the Revolution. The foundry was constructed on a site now covered by Spruce Run Reservoir. Remaining a rural and residential, the township, with Route 78 crossing through it, has attracted large businesses such as Foster Wheeler Corp, home to its international headquarters. The Clinton Wildlife Management Area and part of the Union Forge Nature Preserve overlook Spruce Run Reservoir. The southernmost municipality in Hunterdon County, West Amwell is still largely rural, and home to the historic villages of Rocktown and Mount Airy, with its picturesque church and a stone storehouse and tavern from the Revolutionary War era.